Not to be confused with this swift. The common swift (Apus apus) can be found all across the UK during these summer months. Swifts have a wingspan between 42cm and 48cm and are mostly black-brown the exception of a white to cream colored chin and throat. This supreme aerial flyer is an insectivore and feed mostly on airbourne insects and spiders that it gathers in its mouth as it glides through the air, the insects gather in the swift’s throat and mix with saliva to form a food-ball or bolus with as many as 300 insects per bolus. The swift’s natural predators are Eurasian hobbies and sparrow hawks but it has adapated several stratgies to avoid predation, being a superb aerial acrobat and nesting on vertical surfaces such as rock walls and chimneys. I don’t know about you but this time of year is often confusing as you look up and see the glimpse of a forked tail and have a thought to yourself, is that a swift, a swallow or a martin? It’s an easy mistake to make as they are frequently mistaken for each other. They all have very similar mostly aerial lifestyles and are summer visitors to these isles. The BBC has very handily produced a guide to tell your swift from your martin from your swallow, check it out here. Despite being superficially similar the swifts, martins and the swallows actually belong to two different families of birds. 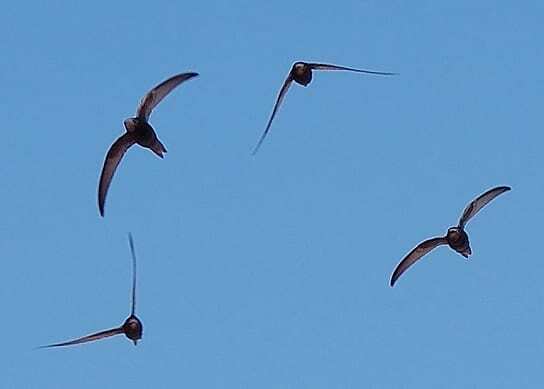 The swifts belong to the family Apodidae and are more closely related to hummingbirds than they are to swallows and martins which belong to the family of passerines (or perching birds) known as Hirundinidae which includes 83 species of swallow in total. The edible-nest swiftlet (Aerodramus fuciphagus) is found in South-east Asia and, I think, has the accolade for producing an ingredient for the most bizarre human food of all, swift nest soup. 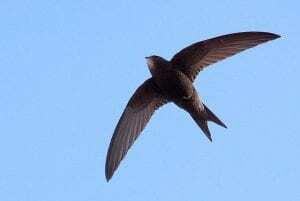 This swift’s nest is made up of solidified saliva, and is made high in deep mountain caves. The nest has been used in Chinese cuisine for over 400 years and is used by steaming or soaking the nests. Some populations of the swiftlet have been harvested extensively leading to them being considered critically threatened. 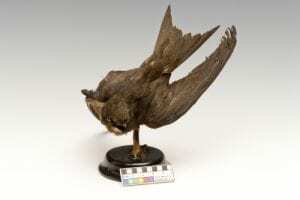 The common swift is a summer breeder in the northern hemisphere and here in the UK we are at the western most edge of it’s range than extends to China in the east. These small birds make the massive journey south to overwinter in Equatorial and Sub-Equatorial Africa with UK swifts making the longest journey some 14,000 miles. We are just understanding their routes thanks to geo-locators, but mostly scientists have no idea the routes these birds take to their winter grounds. Artist Tom Bailey has been a Leverhulme Trust funded Artist in Residence at the UCL Migration Research Unit since January and has developed an intimate, solo walking exploration of migration, through song. Migration is essential to the evolution of life; yet this is ignored within contemporary political and media discussions on refugees. 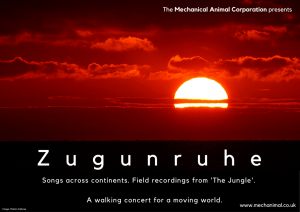 For two weeks from Monday 5th June we are the starting point for Tom’s walk, Zugunruhe. The 45-minute sound-journey across African and Middle-Eastern migration routes, without leaving Bloomsbury. 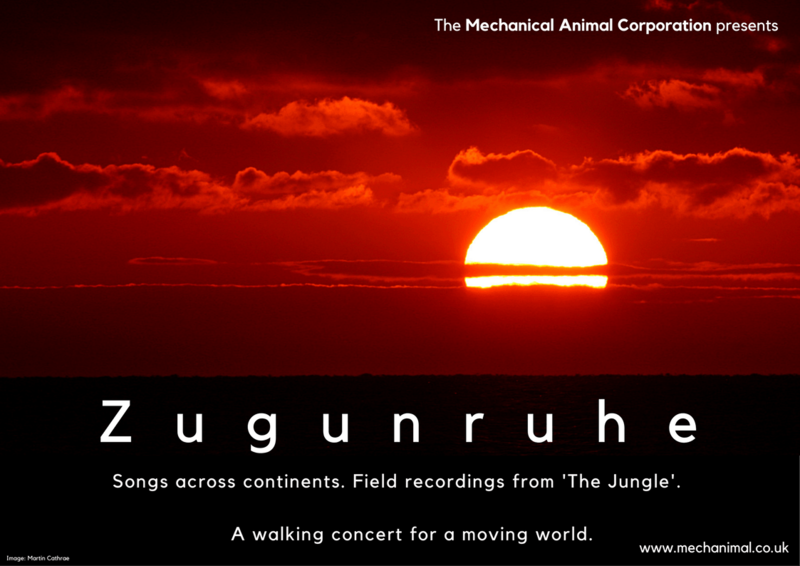 Zugunruhe is composed of Eritrean, Egyptian, Iranian and Sudanese songs shared by residents of the Calais ‘Jungle’, interwoven with calls from globally migrating birds. Zugunruhe is an ornithological term describing a state of ‘migratory restlessness’ in birds. The walks are free and if you are interested you can book your ticket by visiting the booking page here. Zugunruhe is part of the UCL Festival of Culture.